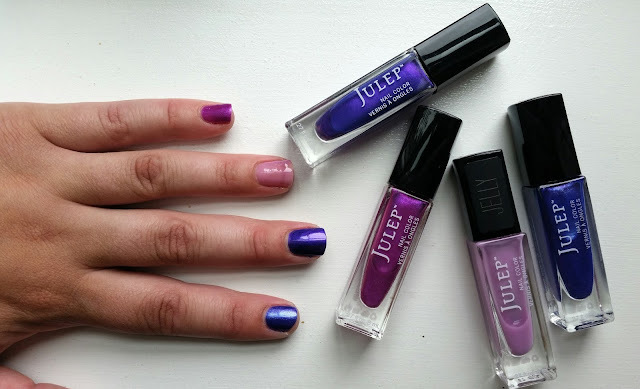 I've been a Julep Maven for a while now, and while I've been choosing their beauty/skincare over their nail polish pretty frequently of late, I have to admit that their selection of purples is really unique. From top to bottom, I'm wearing Katie (Classic with a Twist), Ming (It Girl), Avni (Classic with a Twist), and Danica (Boho Glam). I don't go for purple polish most of the time, but college football season is starting to whisper in my ear, and I love to support my Northwestern Wildcats with a manicure. Katie and Avni are both shimmery creams that go opaque in two coats. Danica, my most recent edition is a pretty cool blue-purple duochrome, I'm liking it a lot more than I thought I would. Ming stands alone as the only jelly, but it's a good one that makes a great jelly sandwich, or just a soft spring mani on its own. If you feel like becoming a Maven, you can use this link to sign up. While the polish formula can be hit or miss, the color selection is great, and I love many of their cleansing products.